Outfit your living room with the chic, casual appeal of this exceptional sectional sofa. The two-piece sofa is able to comfortably seat three people, but unlike an ordinary three-person sofa, this is fitted with a long, curved chaise lounge for stretching out your feet or for presenting a tray of delicious snacks at your next gathering. 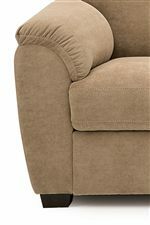 The tall back of the sofa and plush pillowed arms will gently hug your body with the soft, resilient feel of high density foam cushions and fiber filled arms. This piece has an understated, casual silhouette, and minimalist design accents, creating a piece that will look subtly stylish with your casual or contemporary style living room. The Lanza Casual Sectional Sofa with RHF Corner Chaise by Palliser at Malouf Furniture Co. in the Foley, Mobile, Fairhope, Daphne, and Gulf Shores, AL area. Product availability may vary. Contact us for the most current availability on this product. 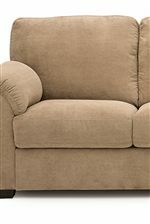 70347-07 LHF Loveseat 1 54" 38" 34"
70347-35 RHF Corner Chaise 1 84" 38" 34"
Enjoy the clean, casual look and remarkable comfort of the the Lanza collection in your home today. The chic and understated look of these pieces is created by comfortable design accents like plush pillow arms, boxed-edge cushions, and tapered, exposed wood block legs. The Lanza collection makes it easy for you to outfit your distinctive living space, offering both smaller sofas and loveseats as well as a selection of sectional sofas. The remarkably stylish sectionals from the Lanza collection are available in unique shapes, like a square, conversation-style sofa, and include handy accents like plush chaise lounge pieces. Choose the fabric or leather of your choice to make this subtly beautiful collection fit perfectly into your fashionable home. The Lanza collection is a great option if you are looking for Casual furniture in the Foley, Mobile, Fairhope, Daphne, and Gulf Shores, AL area. Browse other items in the Lanza collection from Malouf Furniture Co. in the Foley, Mobile, Fairhope, Daphne, and Gulf Shores, AL area.